Index SOLD Price: $NZ 50 (Estimate) Loops no longer made with Fine Silver - replaced with Sterling Silver (925/1000). Available on Order - expect 2 weeks for making and delivery. 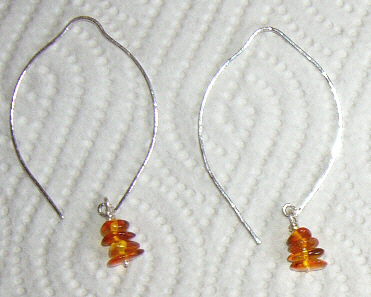 The 50mm long loops are hand-forged from Fine Silver (999/1000) and the Amber chips are attached with Fine Silver wire. N.B. Although they look a bit lemon-shaped when off, once in the ear the earwires appear to be 'hoops'.